There is always something magical about the full moon and the best way to embrace its empowering effect is by celebrating its presence in great company, over creative cocktails, delicious food and captivating views. In July together with my girlfriends from Travel Bloggers Greece we welcomed the Full Moon at POINT a Bar and Restaurant . A warm summer July night, we gathered at the rooftop restaurant of one of the hotspots of Athens. For those of you who haven’t been there yet, must definitely add it to your Athens to do list. 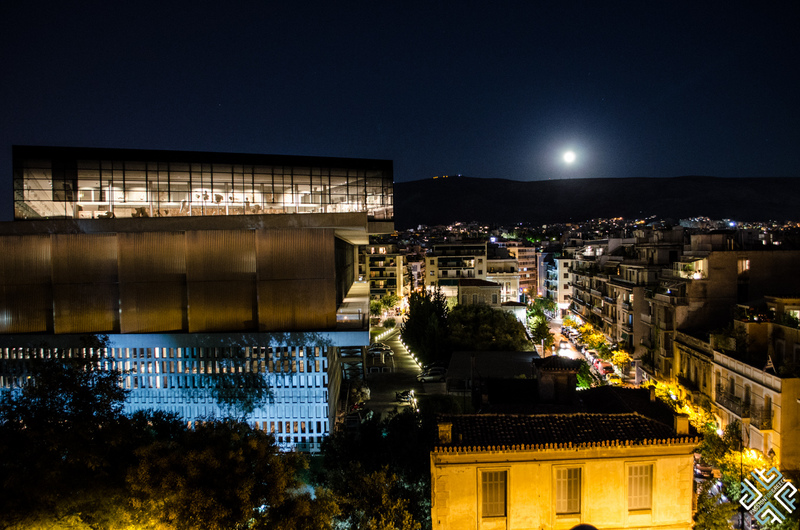 A it has the best view of the Acropolis and B you get a sneak peak inside the Acropolis Museum and C the Cocktails are just fab. POINT a Bar and Restaurant is located on the fifth floor of the Herodion Hotel, a cozy setting that guarantees a remarkable evening under the starry Athenian sky. Great for an evening of cocktails created by the talented Bartender & Cocktail Consultant, Lefteris Sofantzis, their menu is anything but ordinary. Make sure to try the Tapas Cocktails which are Lefteris’s signature creations. Feel like Drama, reinvented in a glass? How about trying ACT ONE: DRAMA made of Ouzo, Fresh grapefruit juice, Thyme infused M.B. lime cordial, Fresh lemon juice served with the Basil tapas: cheviche with tiger’s milk. At POINT a creativity goes beyond, imagination and we have only mentioned the cocktails. 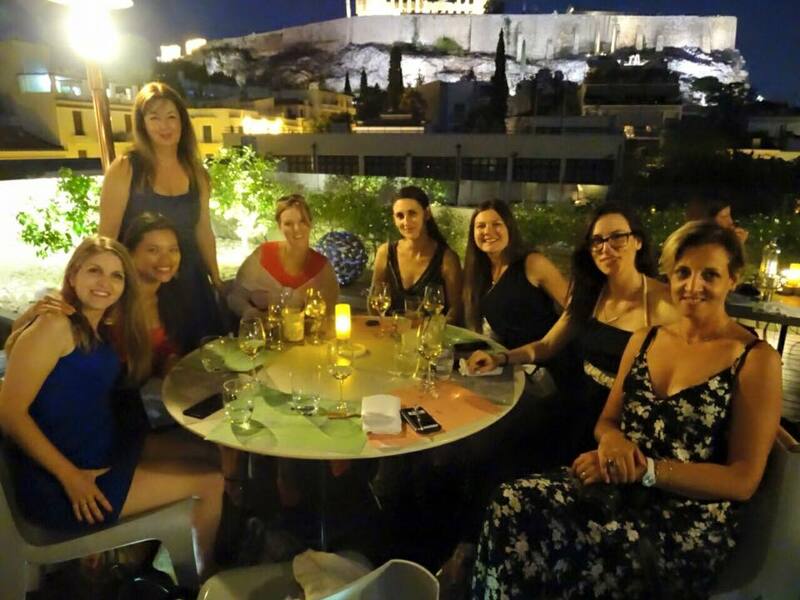 Our evening went as follows: first we savoured the delicious cocktails and a few selfies down the line with the view of the Acropolis as a backdrop, it was time to indulge in the eclectic menu created by Manolis Mavriyannakis and Marios Pirpiridis. The restaurant serves Mediterranean cuisine with Greek traditional influences. Here you will find the classical Greek dishes which are anything but classical, from the Moussaka which is served on crusted potatoes with yogurt mint sauce to Gemista which literally look like statues in an art gallery. POINT a is best described as an artists’ playground, colourful, imaginary and sensual. The famous Greek salad is nothing like you have seen, ruled by cherry tomatoes, the whole presentation is spectacular. Travel to Mykonos with the culinary delight inspired by the island, the Myconian salad is definitely a must-try. First you have to break a delicate bread crust before you can get your fork inside the avocado fusion, topped with the renowned cured meat known as louza and the kopanisti cheese. Ask for the King fish, served with courgette flowers and buttery fish roe sauce, this dish is yummylicious. If you feel like pasta, there are some exceptional dishes to try like ravioli with octopus ragú and beetroot crisps, fisherman’s pasta and POINT a’s own version of carbonara with “syglino” from Mani (pork salted, dried and smoked). There are many reasons why you should visit POINT a Bar and Restaurant and the Full Moon makes it even more appealing. You can’t fight the moonlight, can you? The restaurant operates from May to October.